Follow Friday Fun Week 21: This weekly meme is hosted by Parajunkee and Alison Can Read. Check out their blogs for details/rules, and to join! Also, be sure to check out this week's featured bloggers on each of the girls' sites! This week's question: Keeping with the Spirit of Giving this season, what book do you think EVERYONE should read and if you could, you would buy it for all of your family and friends? That would be my new favorite book, Anna and the French Kiss by Stephanie Perkins. Everyone raved about this book and I was curious, so I finally read it last month and LOVED it. I’m so glad I own it because I know I’ll definitely read it again. I won’t go on and on, but if you want to know what I thought, you can read my review. If you haven’t read it, but you’ve been thinking about it, BUY IT. Seriously. I’d buy it for you if I could, I loved it that much lol. TGIF at GReads Week 17: TGIF is hosted by Ginger at GReads - be sure to check out her blog and join in the fun! This week's question: Book to Movie: Which book turned movie do you feel did the best adaptation? What about the worst? Hands down, best book to movie adaptation is Harry Potter. I think they did a fantastic job with the movies. They followed the books very closely, the casting was perfect, and I think the movies did the books justice. Worst…I know a lot of people will agree with me, but there’ll be some who don’t…feel free to state your opinion, but let’s not start a war here please lol. Twilight. I loved the books and I’m not ashamed to admit it. But the movies…oh god, the movies…the acting is so bad, it hurts me. It physically hurts me. Rocks show more emotion than Kristen Stewart. She’s so awkward, watching her makes me squirm in discomfort. I swooned over Robert Pattinson in Harry Potter, but he doesn’t do much for me as Edward. I like Taylor Lautner and I like the guy who plays Charlie, but that’s about it. And yet, I continue to see the movies. I’m a masochist, what can I say? Right from the very first episode of Vampire Diaries, I’ve said they should have cast the VD actors in Twilight. I could totally see Nina Dobrev as Bella and Paul Wesley as Edward. We’d need to find a role for Ian Somerhalder too because damn that boy is hot…and he can actually act. Taken 2 weeks ago in Niagara Falls. 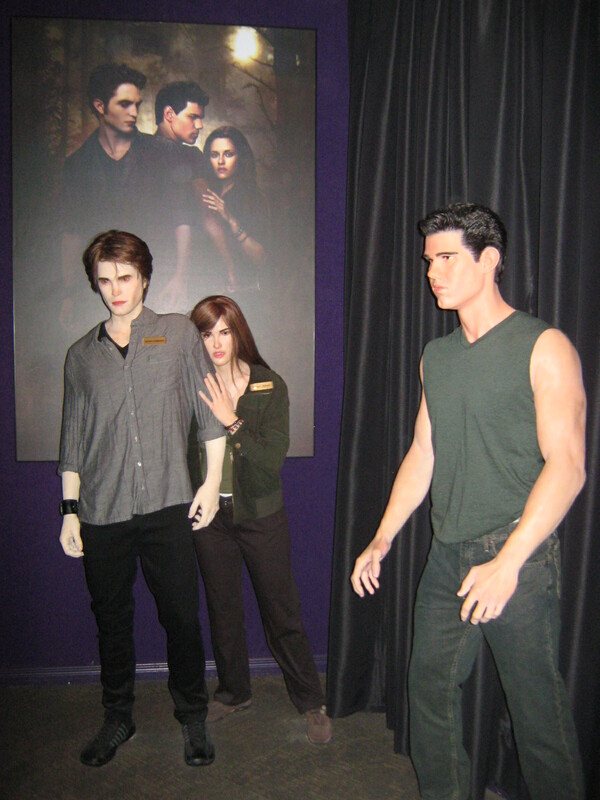 That wax figure could probably do a better job playing Bella than Kristen Stewart. BTW, I lifted up wax Taylor's shirt and he had a six-pack. That kinda made me giggle...and take some slightly inappropriate pictures that I'm not sharing with you guys. Happy Friday my darlings! Just FYI, the Blue Sky Days Blog Tour is officially booked - woohoo! It's going to run from January 17th until February 14th. Be sure to check out the amazing line-up of bloggers here. I'm so excited, I can't wait! I hope you all had a terrific week. There's one week left to enter by 400 follower/birthday celebration giveaway, so be sure to enter if you haven't already! Have a great weekend! Hopping through. So agree with you on Anna and the FK. It's incredible. And the Harry Potter series was definitely well cast. I agree about the HP cast! Happy Friday and check out my follow Friday! Hi Marie. Old follower, but hopping through. Stephanie Perkins books are a great gift choice. Marie, you just made me laugh out loud with your commentary on Twilight, AND that comment underneath the picture. :D I couldn't agree with you more. Kristen Stewart isn't great on Twilight, but she is surprisingly good on the movie Speak (based on Laurie Halse Anderson's book). That was a good movie adaptation there. New follower, your blog is definitely worth following! Mwahaha! I love that it looks like Edward's trying to shrug her off! My best friend calls KStew as Bella 'twitchy'. I don't think you're alone in thinking the wax model'd do a better job. AND OH MY GOODNESS I'M DYING--I swear I'm TERMINAL--TO READ ANNA AND THRE FRENCH KISS! EXCLAMATION MARK!